Close your class and send a class archive to participants. If you are on a paid plan, you'll stop getting billed for the class. All participants will receive an email containing a copy of their content from this class. 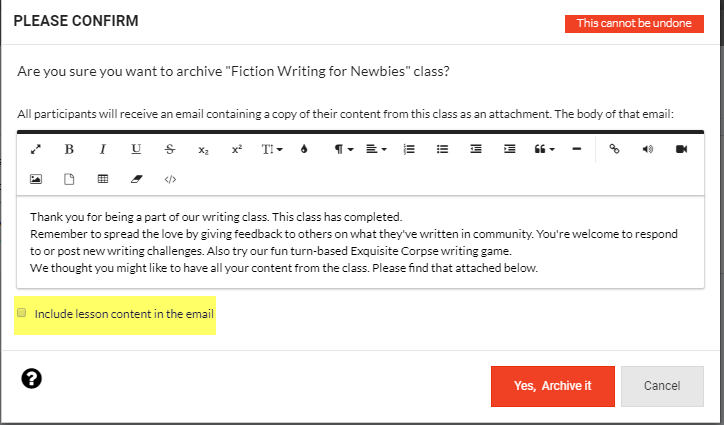 For the next 3 months, you will have the option to email a copy of the class archive to yourself or to a participant, from your administration area. To close a class, go to the "Class Administration", choose "Archive class", then click on the "Archive Class" button. This will bring up a confirmation request. You can edit the email text that will be sent with the archive. You will also be able to choose to send lesson content or not.